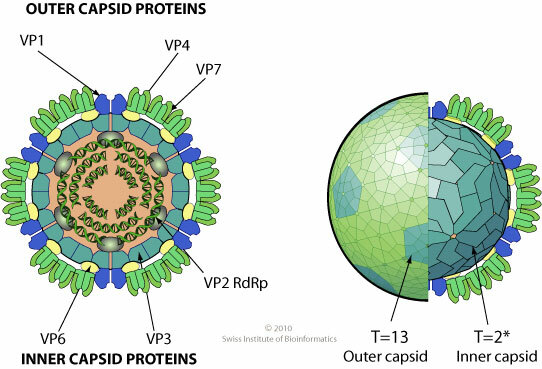 Non enveloped, icosahedral virion with a double capsid structure, about 75 nm in diameter. Pentameric turrets sit on the outside of the innermost capsid. The outer capsid has a T=13 icosahedral symmetry, the inner capsid a T=2* icosahedral symmetry. Segmented linear dsRNA genome. Contains 11 segments coding for 12 proteins. Segments size range from 0.8 to 4.0 kb. Genome total size range from 18.2 to 30.5 kb. The dsRNA genome is never completely uncoated, to prevent activation of antiviral state by the cell in response of dsRNA. Viral polymerase synthesizes mRNA from each dsRNA segment which are translocated to the cell cytoplasm where they are translated. HOST Aquatic vertebrates and invertebrates: fish, shellfish and crustacean species. GEOGRAPHY Golden shiner reovirus (GSRV) appears to be confined to the southeastern area of the USA where golden shiners are reared commercially. ASSOCIATED DISEASES In general, aquareoviruses have low or no pathogenicity for fish. However, some cause hemorrhagic disease, hepatitis and pancreatitis. Grass carp hemorrhage virus that causes hemorrhagic disease of grass carp is the most pathogenic aquareovirus.